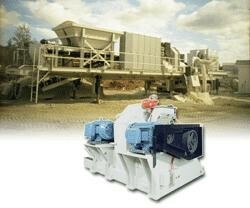 Stedman’s 4-Row Cage Mill allows Aglime producers to meet most state Aglime specifications in open circuit. The field proven Stedman Cage Mill is efficient and reliable and will economically produce Aglime to any specification for both large and small producers. Dependable, the Stedman 4-Row Cage Mill produces consistent product quality, very little change in product throughout the life of the wear components even with high moisture feed. Feed does not have to be dry. Clogging, jamming, and plugging are eliminated. Typically the cage mill is mounted stationary. The unit shown is a self-contained portable plant that includes motor control center and dust collection. A portable plant makes it easier to relocate within or to another manufacturing location. Operation is simple. Material is loaded into the feed hopper or hoppers, conveyed to the cage mill, crushed, and discharged out the side. Discharge on the Cage Mill is completely open and requires no screens or grate bars, eliminating the cleaning and replacement of discharge screens or grate bars. The Stedman 4-Row Cage Mill is available with capacities as low as 5 TPH up to 100 TPH. Since product requirement affects the throughput, in general, the larger the mill the lower the cost of operation when measured against ton of output.